Who knew I’d have so much fun in Philadelphia, much less miss it or the new people I met there as much as I am right now. Tonight I am just aching to create pictures, go out with my camera and capture the world and process it into something beautiful. I just love this picture I took while in Philadelphia, and to think I almost forgot about the entire panorama of pictures I took. This trip Ryan and I took through the northeast was so much fun. In fact, it was the most fun I’ve had in ages, and perhaps the most fun I’ve ever had on a vacation. I’m a very lucky person to have Ryan in my life. He planned out 90% of this trip and managed to keep me sane with all the travel arrangements that would normally have made me completely batty. 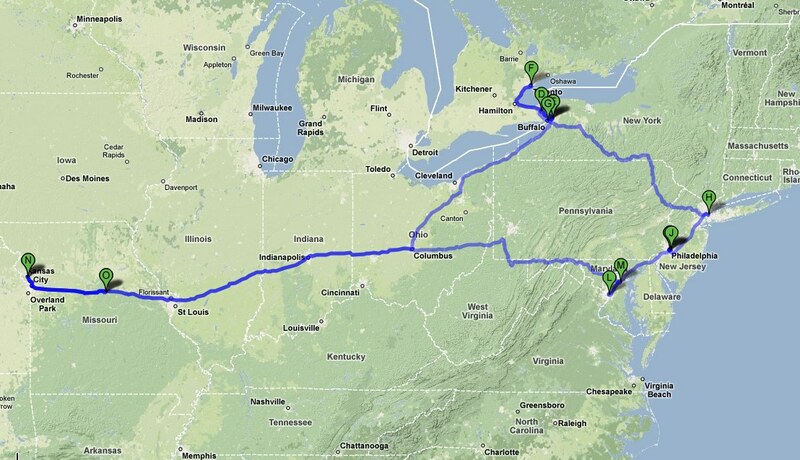 Here’s a map of our travels! It looks like our next major trip will be this summer, back to San Francisco for pride. Can’t wait! Traveling with Ryan is just about the most fun you can have. Plus I’ll get to take pictures… though I am really aching to travel to Europe… I’ve never taken pictures there. Visited? Yes. This entry was posted in Art, Life and tagged Fun, Love, Philadelphia, Photography, Ryan, San Francisco, San Francisco Bay Area, Spring Break, Travel by Justin Scott. Bookmark the permalink.